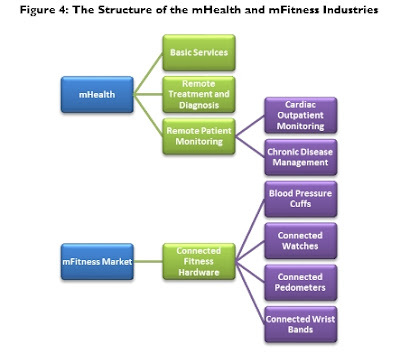 Mobilizing the Healthcare and Fitness industries is about to gain market momentum, particularly in developed nations. The converged mHealth and mFitness sectors are defined as the point where the mobile communications sector meets the healthcare sector and the fitness sector, respectively. According to the latest market study by Juniper Research, the mHealth market forecast for cumulative cost savings from remote patient monitoring will reach up to $36 billion globally, over the next five years. This is a significant opportunity, as healthcare in the developed world moves towards the concept of offering "accountable care" services -- where funding is linked directly to the health of the patient or individual rather than being based upon the cost of treatment. Even though remote patient monitoring -- particularly for chronic diseases -- is still at a very early stage in the development cycle, it fits well with new healthcare practices and the goal of keeping patients out of hospital. Meanwhile the combination of the smartphone, mHealth attachments and companion apps is creating an entirely new route for providing mHealth services. Smartphone-based mHealth is expected to grow more rapidly than mHealth services delivered through bespoke devices, according to the assessment by Juniper. "mHealth hardware linking directly to a companion app on the smartphone has become an exciting new area of mHealth," says Anthony Cox, associate analyst at Juniper Research. "It is also drawing attention to what mHealth can bring to the table." Western Europe will be the most promising new market for cardiac outpatient monitoring after the U.S. as partnerships emerge for its provision in the region. Demonstrating cost-savings to those funding the healthcare sector is likely to be the most effective way of advancing mHealth. There will be robust growth in the adjacent mobile-fitness industry, driven by a motivated user-base and coherent product offering from several players. In spite of positive signs in several areas of the mHealth industry, the current vendor business models are hampered by a lack of clarity on how they will be reimbursed for the services they provide.